Around 1854, as Broadway just south of the fashionable Union Square filled with refined residences, Jacob Cram build a row of Italianate brick rowhouses on the thoroughfare's east side between 21st and 22nd street. If Cram’s attractive building at the corner, No. 922, was ever intended as a single-family home it did not remain one for long. In addition to lighting fixtures the firm supplied brackets and related chandelier parts and provided installation and customization of the devices. 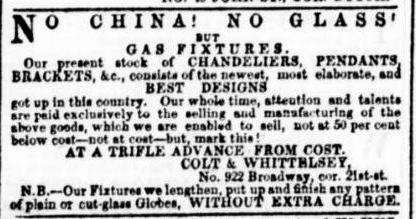 At a time when most chandeliers were fueled by whale oil, the Colt & Whittelsey offered up-to-the-minute gas fixtures as well. George s. Park’s school for boys was gone by 1859 and the upper floors of No. 922 had been converted to the Bancroft House hotel. Run by M. L. and A. W. Bordwell, it had previously been located just a block to the south at No. 906 Broadway. Julia Fitzgerald was a chambermaid here in December 20 of that year when a friend was invited to a ball. Apparently her friend had nothing appropriate to wear, so Julia “borrowed” jewelry—a gold bracelet and breastpin—from the room of a guest, Mr. Duscom. She also borrowed $25. Her employment at the Bancroft House was suspended as well. The fish-scale slate shingles survive after nearly a century and a half . Exactly one year later South Carolina seceded from the Union and the first storm clouds that would become the Civil War formed. By 1864 the nation was embroiled in a bloody conflict. On Saturday October 1 of that year a group of “War Democrats” chaired by Peter Cooper met at the Bancroft House. The delegates agreed on “no surrender of flag or principles to rebels in arms against the country, and no armistice that would give the traitors any advantages over the soldiers of the Union,” reported The Times. Three days later the group met here again. It resolved to appoint a Committee of War Democrats to work with the War Democratic State Committee of the State of New York, and the War Democratic General Committee of the City and County of New York to make arrangements for a “mass Convention of the War Democracy in the City of New York” prior to the upcoming election. The committee was composed of the leading names of the city, including A. T. Stewart, George Butler, and Edwards Pierrepont. T. Redding was a long-term resident here as well. In January 1866 he wrote to the Editor of The New York Times in support of the proposed mass transit—subways and elevated trains. Not everything went perfectly at the Bancroft House. Only a month earlier Mrs. Margaret Butler returned to her rooms here around 2:00 in the afternoon of May 27. She noticed that the door, which she had locked, was forced open. Hearing her at the door, two men rushed past and darted down the stairs. In the early 1880s Amos R. Eno owned the property. Eno was a major player in the real estate field and also held title to the strange triangular plot of land just across Broadway which would later become the site of the Flatiron Building. In June 1884 he sold No. 922 to Charles W. Burgoyne, a “provision dealer,” for $138,750 who established his store on the ground floor. By now it had gained a handsome mansard roof, adding an entire floor, and had been extended back along 21st Street from 65 feet to 97 feet. A bizarre string of suicides in the hotel occurred over the next two decades. In May 1891 Thomas Atchison, just 21 years old, shot himself in the temple with a revolver. He was a bellboy at the Hotel Clarendon. On August 24, 1895 61-year old Ferdinand William Herrman, who had lost his fortune and was despondent over the financial troubles to his family, took poison. Six years later on December 12, Frank Neumann drank carbolic acid here. The 30-year old lived in Newark, New Jersey. And on July 30, news correspondent Joseph B. McShane filled his room with gas and died for no apparent reason. A ghastly murder-suicide occurred on July 30, 1887. John E. Emmerson had been employed as a porter by the Bancroft House for about five months, but he resigned to work at the Astor House. The middle-aged man whom the New York Tribune described as “of surly disposition and unsocial in his relations with other employees,” kept his rooms on the third floor here, though. 19-year old Charles Greer, who was visiting the United States from Ireland, had run out of money and while waiting for funds to arrive from home, took a temporary job at the Bancroft House so he would not have to borrow from friends. It was a fatal decision. On October 26, 1888 Burgoyne received $200 for allowing the Committee of Democrats and Independents to attach one end of a banner to the Bancroft House. The banner, which stretched across 21st Street, read “For President, Grover Cleveland. For Vice-President, Allen G. Thurman. For Governor, Warner Miller. For Clean Government and Ballot Reform.” Except for the names, nothing much has changed in a century and a half. Despite his attempts, young Ruth Stephenson stayed in the hotel business. For some time American Express ran a branch office from the ground floor. Then in 1919 Max Haber, who owned the Delmonico, Waldorf and Columbia restaurants, leased the store and basement of No. 922 Broadway where he established a restaurant and bakery. The space would remain a restaurant for decades and in January 1927 the K & B Lunch Company took the lease for 21 years. Brick panels on the chimney fronts add architectural interest. 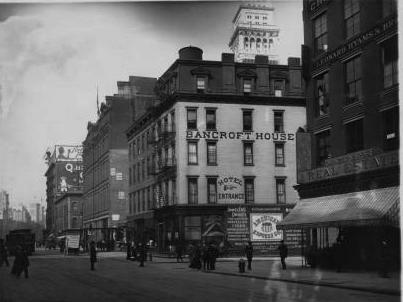 By the middle of the century the stretch of Broadway below 23rd Street was a bit dowdy and the once-respectable Bancroft Hotel was now called the Court Hotel—a little less respectable. But in 1978 the upper floors were converted to four roomy “Class A” apartments per floor. Today the street level has been mostly obliterated. But the distinguished bulk of the hotel and its handsome slate-shingled mansard is highly unchanged from the days when gentlemen paid $1 for the best room in the house.